Stay on top of the latest kitchenware trends | Atelier du Chef - What is a professional kitchen’s key to success? Foolproof storage! What is a professional kitchen’s key to success? Foolproof storage! Organizing a commercial kitchen for optimal performance is a necessity. Choosing the right kitchen storage can contribute to the flow and efficiency of a well-organized work space. Avoid running around looking for a tool or product. Organize shelving into specific areas by placing supplies and utensils in areas dedicated to cooking and preparation, and service dishes near plating areas. A well thought-out kitchen and storage can definitely increase productivity! Métro has been offering adapted solutions for professional kitchens for more than 80 years. Their storage systems are the most efficient and organized in the industry to help increase your productivity. In 1929, Métro began producing metal shelving systems at their Pensylvania headquarters. Over the years, their products evolved into a complete line of storage systems. Métro’s products include stainless steel and polymer shelving, trolleys, wall storage, hot plates, and much more. All products are manufactured to provide practical solutions for restaurants, grocery stores, health facilities, or any other professional kitchen. Métro products are designed with adjustability, handiness, resistance to corrosion, energy efficiency, ergonomics, and durability in mind. Find the perfect storage solution for your kitchen amongst Métro’s wide selection of products. Because we understand every detail is important, our storage solutions will help you attain maximum efficiency. Métro’s original storage system since 1965! These adjustable wire shelves have been imitated but never be equaled. Solidity. It can support up to 363 kg of well distributed weight. Easily installed on fixed, mobile or wall mounted shelving units. Designed to reduce dust accumulation and allow air flow. Wide variety of accessories to help identify, organize, and carry products. 304 Stainless Steel: highly resistant to different uses and environments. Metroseal 3 coated metal: corrosion resistant, ideal for humid environments, 12 year warranty against rust and corrosion. Chrome plated: ideal for dryer spaces. Brite: economical and ideal for spaces with low humidity. Coloured epoxy: offers an interesting color palette for dry environments. This improved system comes with a 12 year warranty against rust and corrosion. 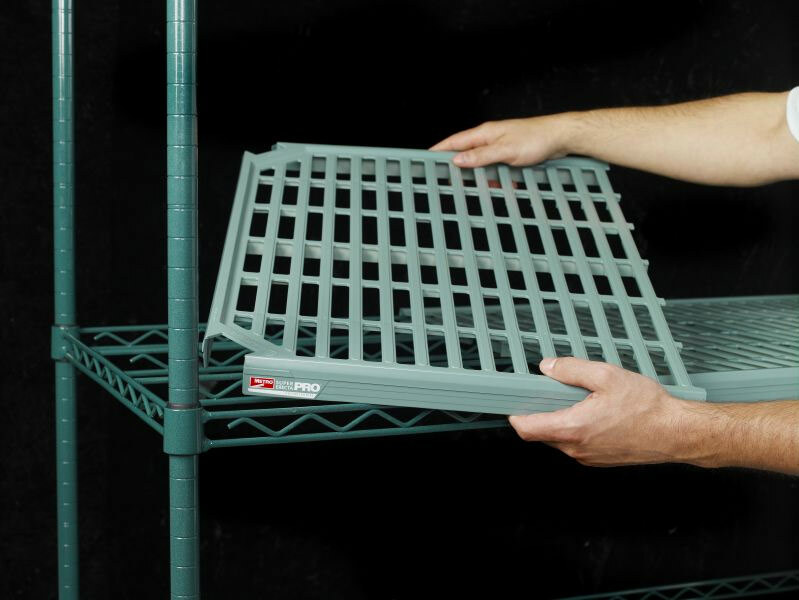 Super Erecta Pro systems feature the same characteristics as Super Erecta systems, with added removable polymer shelving. 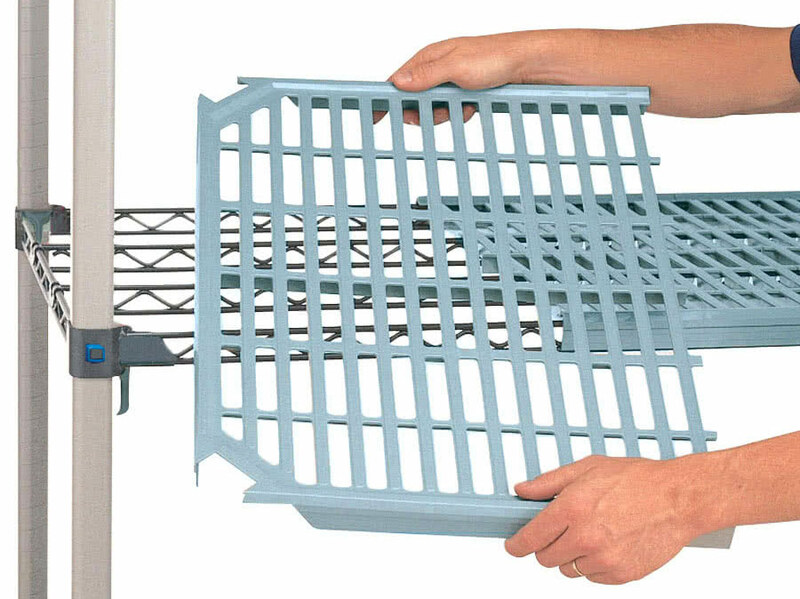 Easy to clean by hand and dishwasher safe removable shelves. Solidity. Each shelf can support up to 363 kg. Flexible installation: compatible with all other Super Electra systems. 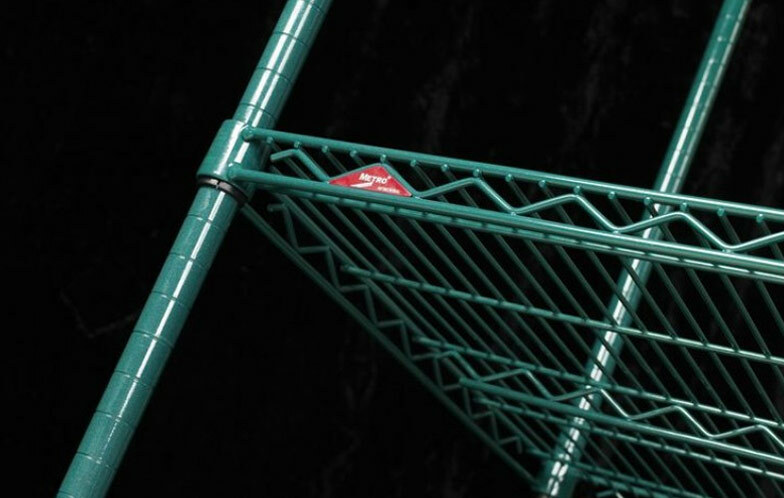 Compatible with the entire range of Super Erecta systems. Multiple uses: fixed or mobile shelving units, rail systems, and wall-mounted systems. This system is easily adjustable and easy to clean. It comes with a 15 year warranty against rust and corrosion, is more durable and easier to maintain than our traditional epoxy coated shelves. It is perfect for humid environments and refrigerated rooms. Microban coated shelves and mats. Multiple storage options for fixed, mobile, and high density storage areas. Shelves adjust easily without tools. Easy to clean by hand and dishwasher safe. Robust: 363 kg capacity per shelf. Multiple accessories to help you identify, organize and carry products. As an industry leader, Métro proposes the most stable, practical, and efficient storage systems. Our experts understand each kitchen is unique. They will help you navigate Métro’s wide range of products to find the ideal configuration for your specific needs. Contact us for an evaluation. Our specialists will help you plan the perfect storage solution for your professional kitchen!